Once primarily text-based, social media has become a visual medium. Driven by ease-of-use and the ability to instantaneously upload images from any device, people are sharing more photos on social media than ever before. In fact, according to Deloitte, 2.5 trillion photos were predicted to be shared or stored online in 2016. It's safe to say that number has grown and that photo sharing is predominantly happening across social media. People are uploading images of vacations, celebrations, special occasions, meals, dancing, working and the list goes on. Photos on social media represent many consumer behaviors, preferences, wants and needs that are going undetected by marketers. If a person posts an image of a new product, but doesn't include text including the product's name, it's likely that social media monitoring won't capture it. Companies risk missing out on important opportunities to better understand their customers, improve customer engagement, resolve potential customer service issues and identify new key influencers and fans. 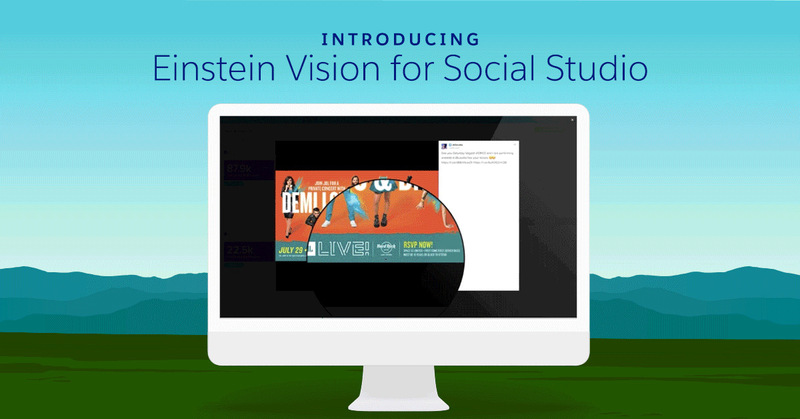 Today, Salesforce is introducing Einstein Vision for Social Studio, delivering AI-powered image recognition directly within Marketing Cloud's social media marketing solution. Now, marketers can automate the discovery and identification of images, and respond appropriately. By understanding the photos that consumers post, marketers are empowered to reach consumers even when they have not specifically mentioned a brand, product or service by name. Previously, marketers would have to either manually sort through thousands of images or analyze associated text to gain insight. With Einstein Vision for Social Studio, they can uncover images relevant to their brand through four types of image libraries, including two million brand logos, 60 scenes, 200 foods and 1,000 objects. Companies now have visual data at their fingertips, getting a deeper understanding of their customers in order to make smarter business decisions. For example, if a restaurant chain is considering adding a new menu item, it can use Einstein Vision for Social Studio to learn about trending options food influencers are sharing through images on Twitter. Marketers can analyze brand integrity, better understand reach and evaluate the effectiveness of social advertising campaigns. For example, if a company sponsors a sporting event, Einstein Vision for Social Studio can detect when and how the company logo from that event is showing up in an image shared on Twitter. Now, marketers can quantify the brand lift associated with sponsoring a particular event like never before. Marketers can monitor social feeds to understand where and how products are being used to deliver proactive social customer service. For example, if an auto manufacturer has a recall for a defective glove compartment mechanism, Einstein Vision for Social Studio can uncover cases through images on Twitter. From there, the marketing team can alert Salesforce Service Cloud to engage with customers for a resolution. 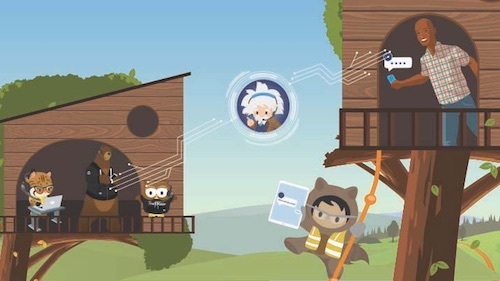 Social Studio leverages the power of Einstein Vision, which allows developers of any skill level to build AI-powered apps and bring image recognition to CRM. Specifically, the Einstein Image Classification API powers image recognition use cases, including visual search, brand detection and product identification. 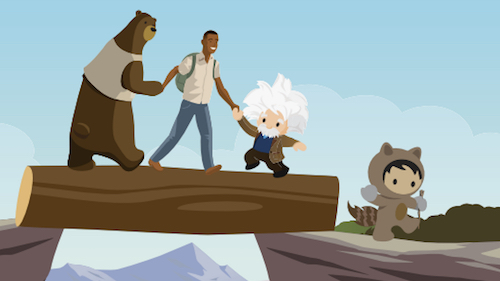 Einstein Vision is based on Salesforce Research’s computer vision breakthroughs, and is the first example of how Salesforce is leveraging cutting edge deep learning research to simplify the complexities of AI for Salesforce customers. These advances in image recognition are ushering in a new era of customer success by enabling companies to discover insights about their customers and predict outcomes that lead to smarter decisions.